ADDIS ABABA, Aug 24 2012 (IPS) - Eight years ago Kenbesh Mengesha earned an uncertain income collecting firewood from local government forests and selling them to her fellow slum-dwellers in Addis Ababa, Ethiopia. She would earn on average about 50 cents a day, if she was lucky. But now she is part of a successful women’s farming project that is a model for training other urban farmer groups all over Africa on how to adapt to climate change. According to the World Bank, Ethiopia is extremely vulnerable to drought and other natural disasters such as floods, heavy rains, frost and heat waves. Global warming has worsened this, as global circulation models predict a 1.7 to 2.1 degree centigrade rise in the country’s mean temperature by 2050. This is expected to have a significant impact on food security. As recently as 2011 the country and the entire Horn of Africa were hit by the worst drought in 60 years. It resulted in a severe food crisis, with the United Nations declaring famine in the region. The World Bank estimates that food insecurity will cost Ethiopia 75 to 100 billion dollars each year to adapt to climate change from 2010 until 2050. So when Mengesha and 29 other women who also used to earn a living collecting firewood formed a local community organisation, it became the start of a safer and more sustainable way of life. “Collecting firewood was and still is a risky job. I know of several women who have been raped by men who take advantage of them while in the bush collecting the firewood,” she says. But today life is less uncertain for Mengesha. And she is no longer cutting down the country’s natural resources in order to get by. 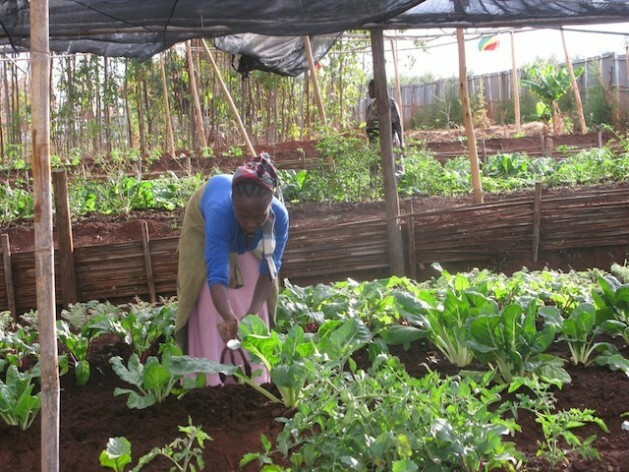 Known as the Gurara Women’s Association, which now has a membership of 200, the group farms almost two hectares of free government-leased land near Gurara slum in Addis Ababa by practicing what it calls an integrated bioeconomy system. Community self-help groups here are allowed to apply for government land through the local government and the sub-city administration – if the project is to be implemented within city environs. The women’s group has a five-year renewable lease. This group of women has discovered innovative ways of handling the ever-changing climatic conditions and combating food insecurity. They were trained by the non-governmental organisation Bioeconomy Africa, which runs the Africa Bioeconomy Capacity Development or ABCD Institute. The women underwent two weeks of training on different integrated techniques in small-scale agriculture. And it has proved successful as it has earned the members of this association enough money to feed their families, pay school fees for their children and even create employment opportunities for others. This in itself is a significant feat in this East African nation, which has a population of 82 million people and is the second-poorest country in the world. According to the Multidimensional Poverty Index, developed by Oxford University, 90 percent of Ethiopians live in utter poverty, with 39 percent surviving on 1.25 dollars a day. “We learned how to utilise the least space whether fertile or not, for maximum agricultural production,” said Fantanesh Atnafic, one of the founding members of the organisation. “In the recent past, we have seen environmental conditions change – drastically. Rainfall is no longer reliable as it was some 20 years ago. Yet when the dry spell comes, it is usually more prolonged than normal, which has a negative effect on agriculture in general,” she said. But a changing climate does mean defeat for smallholder farmers, according to Dr. Getachew Tikubet, the director of operations at Bioeconomy Africa. “It is true that the climatic conditions are changing, which is a huge setback for many African farmers. But the truth is that all problems have solutions. And that is what we are trying to address with African smallholder farmers,” he said. The women’s association uses different methods of intensive farming that create an ideal environment for their crops. “We usually blend indigenous knowledge of farming, such as use of manure, with scientific techniques learned from different organisations and individuals, which include extraction of biogas and methane gas from the cow dung before using the residue as manure,” said Atnafic, a mother of six whose husband was killed in the military 20 years ago. The gases are used as fuel to replace the use of firewood. “We have learned many things. For example, during hotter climatic conditions like what we are experiencing at the moment, we construct structures that are roofed using black nets in order to keep moisture in the soils,” explained Ihite Wolde Mariam, the association’s chairperson. Black net roofing has been shown to reduce the amount of heat on the ground. “Naturally, the black colour absorbs heat. And when we make a greenhouse with a black net, or make ordinary farm roofing using the black net above the crops, we actually reduce the heat underneath by 40 percent. This eventually reduces the evaporation rate, hence saving the soil moisture for the crops,” explained Tikubet. The women’s group has managed to purchase 10 Friesian dairy cows for milk production. The members currently grow various types of vegetables such as spinach, kale, tomatoes and carrots, as well as crops for commercial purposes. The fresh produce is used in the kitchen of the on-site restaurant they opened to the public. “We also use cow dung to produce biogas that is used in the restaurant for cooking. After that, the dung is then converted into organic manure to be used for horticulture,” explained Mariam. For further income generation, the group has started a poultry project, with 500 laying hens. It also has 12 beehives for honey production and four commercial bathrooms where slum-dwellers shower for a fee. “This is one of the most successful urban farmer projects that has benefited from our training programme. They have become a model for training other farmer groups from all over Africa,” said Tikubet. And each member of the group earns between 300 and 350 Birr (16 to 19 dollars) in dividends every month, in addition to the three dollars a day that they are paid for working on the farming project. “The dividend is already good enough. It has enabled me to see my last-born son through secondary school, and it allows me to afford basic necessities and provide for my grandchildren as well,” said Mengesha, a mother of five. *This article is one of a series supported by the Climate and Development Knowledge Network.